The aim of the conference is to begin to develop a robust account of the status of heritage in war by exploring philosophical work on such matters as incommensurability and incomparability, the nature and status of cultural heritage, risk imposition, and the reconstruction and replacement of damaged or destroyed heritage. For more information about the conference, including registration and the latest news on the wider project, visit the project website. This entry was posted in news events publications on April 24, 2019 by admin. The Heritage in War blog has a new post, written by the University of Buffalo’s Carolyn Korsmeyer, reflecting on the replication of historical artifacts. Heritage in War is an AHRC-funded project, co-directed by Derek Matravers (OU) and Helen Frowe (Stockholm), combining aesthetics, value theory and the ethics of war. 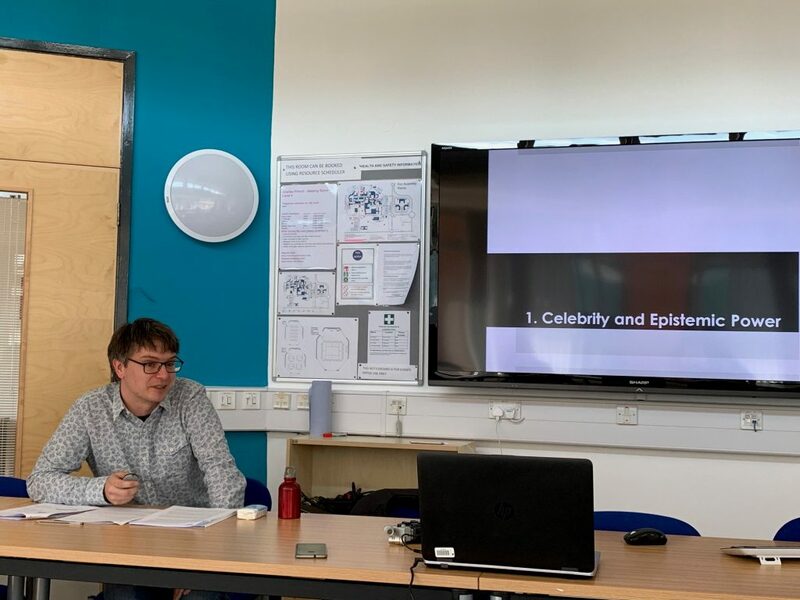 In April’s Philosophy Research Seminar, Dr Alfred Archer from Tilburg University came to speak to us about “Celebrity, Democracy, and Epistemic Power”. You can listen to the talk below. Alex Barber gave a talk on Mary Shelley’s Frankenstein as part of the Belfast Imagine festival on March 28th. In it, he talked about the surprising presence within Mary Shelley’s famous and much-loved novel of her mother and father – the philosophers Mary Wollstonecraft and William Godwin. Wollstonecraft, who was called ‘a hyena in petticoats’ and a ‘philosophizing serpent’ (and worse) by male critics, is best known today for her revolutionary manifesto, A Vindication of the Rights of Woman, one of the earliest works of feminist philosophy. She died ten days after giving birth to Mary Shelley but, as Alex explained in his talk, her ideas live on in the words of her daughter’s extraordinary novel. This entry was posted in news events publications on April 8, 2019 by admin. A full draft programme, and registration details, are available via the conference site. The Heritage in War blog has a new post, written by St Andrews’ Rory Cox, responding to cultural heritage destruction as a security threat. In March’s research seminar, Mark Pinder raised some objections to recent work by Jon Pike and Sean Cordell on issues about cheating in sport, to which Jon offered some rebuttals. They were asking how one should go about defending a theory of cheating in sport. Do you have to analyse the concept of cheating, or should you engineer it? Registration for the first Heritage in War conference, Cultural Heritage and the Ethics of War, is now open! The conference takes place in Cambridge, 18-19 September 2019. Its aim is to begin to develop a robust account of the status of heritage in war by exploring philosophical work on such matters as incommensurability and incomparability, the nature and status of cultural heritage, risk imposition, and the reconstruction and replacement of damaged or destroyed heritage. More information about the conference can be found here, and you can register for the conference here. Professor Sophie-Grace Chappell has written a blog post for the scholarly blog The Junkyard, on How to be somebody else: imaginative identification and the limits of ethics. The post is the first part of three. You can find it here. 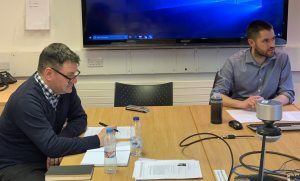 Heritage in War is an AHRC-funded project, co-directed by Derek Matravers and Helen Frowe, combining aesthetics, value theory and the ethics of war. The project has recently announced its first call for abstracts, for an upcoming interdisciplinary conference at Loyola University, New Orleans, in March 2020.